. 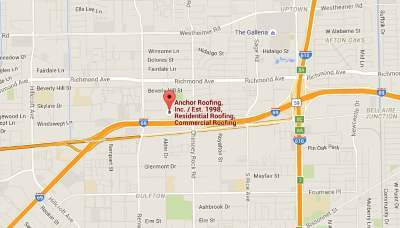 Choose New Roof | Roofing Companies in Houston Texas | Anchor Roofing Inc.
You need to understand roofing terminology. The first term is ‘square’. Roofers use ‘square’ rather than square feet. A square is the basic unit of measurement in roofing. A square has an area of 100 square feet. This is equivalent to a 10-foot by 10-foot square. A typical two-story house, 2,000 square feet, with a gable roof, will need less than 15 squares (1,500 square feet). How much will it cost to roof a house? The material that you choose will determine the cost. The condition of an existing roof (if you are renovating) – for instance, if old materials need to be torn off, or if you need to roof repair the supporting structure, that will add to the cost. Shape – a gable roof (with few or no breaks in the planes) is a simple roofing job. You will find this type on vent pipes, dormers, and chimneys. If you have multiple chimneys, turrets, skylight, and intersecting rooflines, it will increase the cost. The surface of a low pitch or flat roof is different from that of a roof with a high pitch. Some of the materials to choose from include asphalt shingle, wood, metal, tile, and cement, as well as a slate. If you are renovating your house, the existing roof determines the material that you will choose. Flashing is a metal or plastic film used to join dissimilar materials, for instance, masonry chimney and roofing shingles. Good flashing comes in handy to keep your home watertight. There is a high likelihood that leakage will occur where different materials join. Beware of contractors who use tar to join different materials. If you live in an area where wildfires or hurricanes are frequent occurrences, go for products that have a high fire rating and excellent wind resistance. During installation, you can improve your roof’s resistance to fire or the wind. When roofing your home, there are two warranties that you need to understand: the manufacturer’s warranty and a separate warranty issued by the roofing contractor. The manufacturer’s warranty will cover any defects in the roofing material. The roofing contractor’s warranty will handle any problems that may arise from improper installation. The warranty is as good as the company that writes it. Ensure that your contractor is reputable. He needs to have the financial resources to implement the terms stipulated in the warranty if necessary.